The all-new 12th-generation 2020 Toyota Corolla Sedan follows the new Corolla hatchback that arrived earlier this year and rides on a 106.3-inch wheelbase, like its predecessor. The L, LE, and XLE grades will use the current 1.8-liter engine and the XSE and SE grades will be powered by a completely-new smaller and lighter 169 horsepower 2.0-liter Dynamic-Force direct-injection inline four-cylinder engine mated to a new Dynamic-Shift CVT (continuously variable transmission) or the all-new 6-speed iMT (intelligent manual transmission). All models are equipped standard with Toyota Safety Sense 2.0, including a pre-collision system, radar cruise control, lane departure alert with steer assist, lane tracing assist (available on CVT-equipped models), automatic high beams, road sign assist and blind spot monitor is a standard or optional feature, depending on model grade. 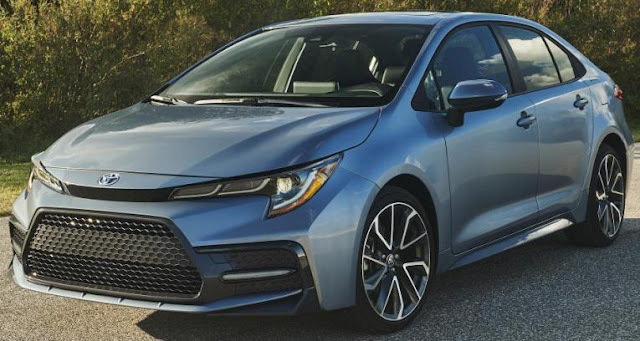 The 2020 Corolla will be available at dealerships Spring 2019.